Todays DIY Fashion is inspired by the semi-upcoming Holiday and my love of Glitter. All around town in stores you will already find Valentine themed décor, gifts & candy. And Valentines Day is still over a month away. This tutorial is very easy and, was very cheap to make. I bought the Hearts at Hobby Lobby for $1.99 and bought a pack of 5 elastic headbands for $1.00 at the Dollar Store. You can use any glue or glitter you have. But all items I used were from Hobby Lobby. Total cost was under $10. Step 1: Check your local Craft stores for felt Hearts, you should be able to find some this time of year. If not you can use those felt sheets you get for 25cents and cut them in the shape of hearts. 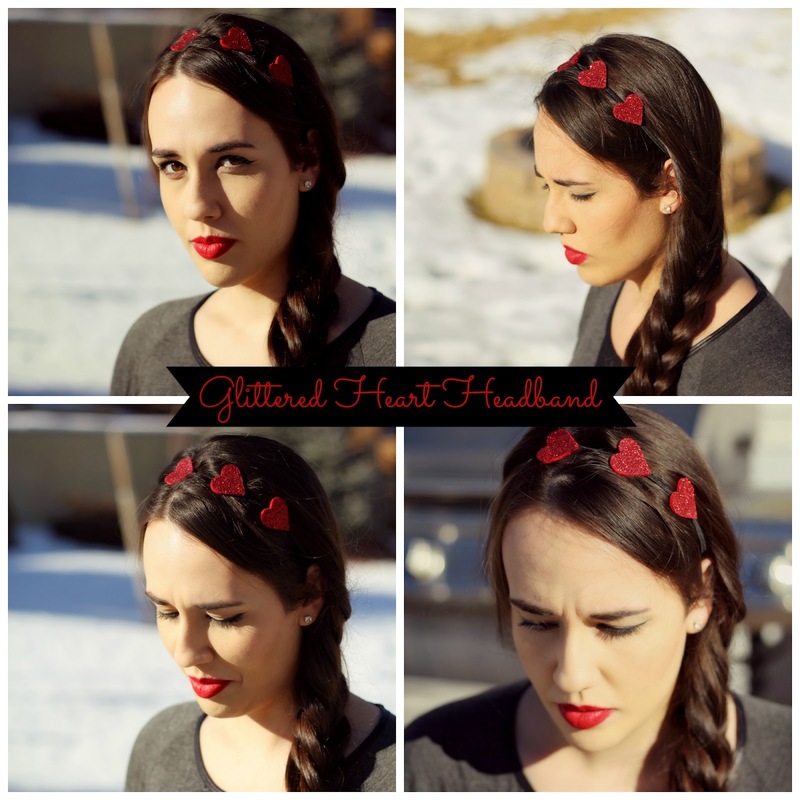 You'll start by deciding how many hearts you want on your headband and how you want them arranged. Then start sewing them on to the elastic headband. You'll want to do 2-3 stitches on each to make sure they are secure. If your not good at sewing don't worry it will later be covered in glitter. Step 2: Once you sew on your first heart repeat that step, I did 3 hearts total but you can do however many you like. Step 3: Using a paint brush, brush on a layer of glue and sprinkle with Glitter. Repeat step on each heart. Optional Step: Once your glitter has dried you can brush on a layer of Mod Podge, This will help for any fallout. Then once partly dried sprinkle on a bit extra glitter. That gives the glitter a better look. I personally don't like the look of Mod Podge on glitter but it helps keep it from falling off, that's why I do it and then put a little extra on top. That way you have two layers. And that is all. Super easy and quick. Longest part is waiting for the glue to dry. This DIY project looks like you did a lot more than you actually did.